1998 Mustang - specs, history, performance changes. 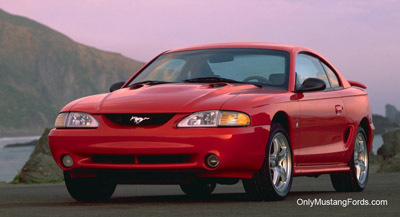 The 1998 Mustang was another carryover year for Ford, yet it actually sold much better than the 1997 production. Maybe it was the Mustang's buying public that were getting used to the discontinuation of the popular 5.0 liter V8 engine and the introduction of the new 4.6 modular V8 engine or the fact that Ford managed to squeeze another 10 horsepower out of the GT, but annual sales actually increased by over 70,000 cars from the previous year. Choices of either a base coupe or convertible, a deluxe Ford Mustang GT coupe or convertible and of course the powerful 1998 Cobra options were all possible on the 1998 order sheet. 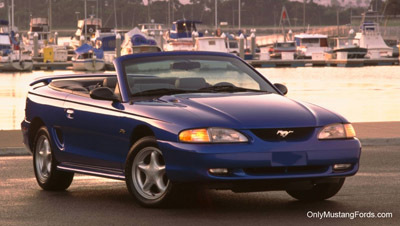 As expected during the carryover period, the 1998 Mustang styling was carried over from the previous year. Choices abounded, however allowing the buyer to choose many ways to further personalize their rides, including a myriad of exterior paint colors in 12 different flavors compared to 10 the previous year and had flashy names like Laser Red and Bright Atlantic Blue. 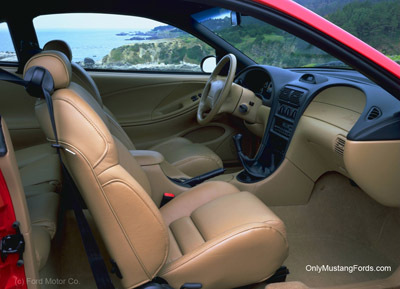 The 1998 pony car's interior was a carryover from the 1997 model year and with nothing really wrong with it's predecessor. it still stood the test of time, looking current and forceful. A total of eight interior color combinations were available, with 3 of them covered in leather. 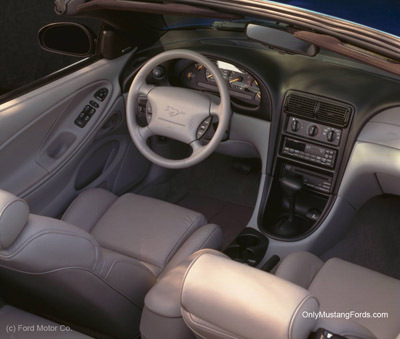 Nicely stitched and detailed, this 1998 Cobra Mustang's interior was a nice place to live! The base 3.8 liter V6 remained unchanged at 150 horse power. Some massaging of the headers and exhaust system conjured up another 10 horse power bringing up the output of the Mustang GT equipped cars with the 4.6 liter V8 to 225 hp. The SVT Cobra continued to post a 305 horse power output with its DOHC (dual overhead cam) 4.6 liter aluminum V8. Ford's specs at the time said it would run a 0-60 mph in 5.9 seconds and could post a quarter mile time of 13.99 seconds.